Jumping jacks! In this story adapted from a 1932 Disney animated short, Santa Claus is too busy to play with all the toys he delivers–until Mrs. Claus gives him a great idea. 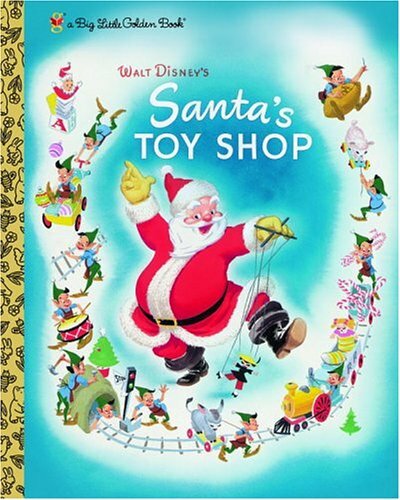 Visit the busiest toy shop in the world and relive an old-fashioned Christmas, with vintage illustrations of classic children’s toys and the jolliest Santa ever! This reissued Golden book will be a hit with three and four year olds! The busy elves, the too-busy-to-play Santa, and his solution (to play at the last house on the route) will make grownups smile even after the billionth reading. This is a sturdier version of the Little Golden Book I had back in the 70s! Very cute- the pictures are exactly the way I remember them! When our, now 22 year old, granddaughter was just beginning to talk some of very first words were “Read to me!” It only seemed appropriate that since this was one of her favorite books and her grandfather read it to her numerous times as “Poppy’s” Toy Shop that we make a special effort to give her a copy at Christmas. I’m sure she will enjoy it immensely and will treasure it as much as she does ALL of the books in her vast library.